Alfat is multipurpose landing page WP theme with super flat style, designed for many kind marketing website. This theme built with twitter bootstrap v3.2.0, CSS3 and HTML5 code. Coming with 18 index variant, 2 skin options (light skin and colorful skin), 6 header options, 3 layout variant, 6 color options, Font Awesome 4.2.0, CSS animate and many more. This theme is built upon bootstrap framework and is fully responsive. 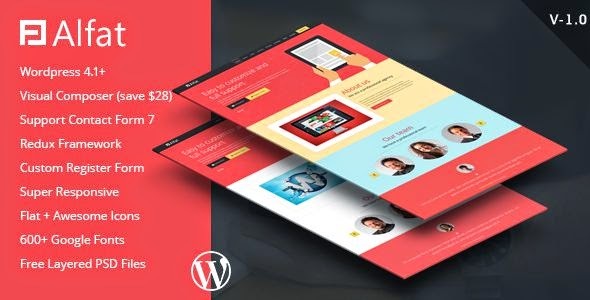 Item Reviewed: Super Flat Multipurpose Landing Page WP Theme 2015 9 out of 10 based on 10 ratings. 9 user reviews.